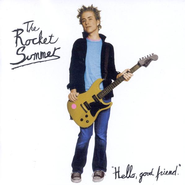 The Rocket Summer: Bryce Avary (vocals, guitar, piano).The second album from Bryce Avary, a phenomenally talented multi-instrumentalist, singer, and songwriter who records alone as the Rocket Summer, offers more of the fresh-faced, open-hearted paeans to love, life, and happiness that made his debut such a refreshing joy to hear. The minor difference this time out is that his hooks are just a tad less rapturous than they were the first time out, and the more significant difference is that his vocal style is quite a bit more bombastic. There are moments during "I Was So Alone," "Tell Me Something Good," and especially "Goodbye Waves and Driveways" when you kind of wince and wish you could pat his hand and tell him to settle down -- no need for all the yelling, dude. But it's impossible to hold his energy and happiness against him, especially when the tunes are this infectious and the lyrics feature lines like "No, this won't be a sad song/There's going to be claps and singing along." Between his love of Jesus (about which he generally sings indirectly, if at all), his love for his new wife, and his love of life in general, Avary is the kind of guy who just makes you smile in spite of yourself.